The large cone shaped molded EQUUSPRING has become the leader in function and design. Since 1984, with many improvements along the way our waterers have proven to be safe and reliable, providing everfresh water to horses. 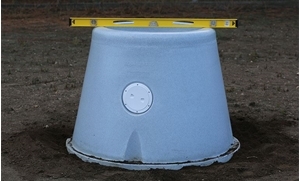 The EQUUSPRING has smooth, rounded edges and a circular design to protect livestock from the injuries common with conventional metal and concrete waterer, and the ultra smooth surface retards algae growth. No weld, no seams to break. 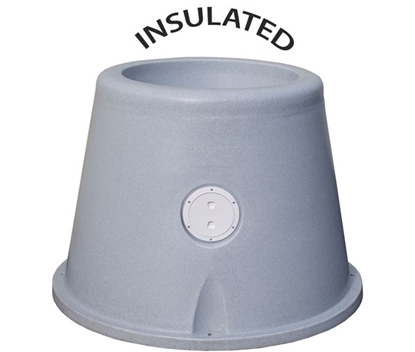 An optional insulated EQUUSPRING, with an electric heater keeps water ice-free in subzero temperatures. They are extremely energy efficient. The dry weight of a standard Equuspring™ pasture waterer weighs 95lbs; the amount of water in the bowl is normally about 25 gallons (200lbs) for an installed weight of 295lbs. When the waterer is set-up per instructions it is fixed in place. 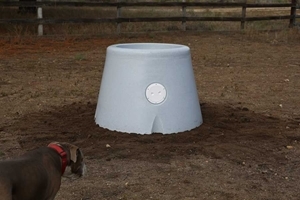 Even large horses that have a reputation of messing with any water container will not destroy or move an Equuspring™ pasture waterer. This product also goes by other names including stock tanks, horse or water trough, and livestock waterer. Order 3 or more Pasture or Stall Waterers and receive a 10% Discount!